This product is FANTASTIC, but it's expensive. 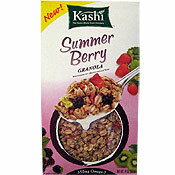 I bought two new granolas from Kashi this week: Cocoa Beach Granola and Summer Berry Granola. I wasn't entirely impressed with the Cocoa variety (read the review here). The Summer Berry variety is much better. In the review for the other variety, you can read my rant about the high prices of boutique-style granolas. It doesn't necessarily apply here. I'm not thrilled to pay nearly $5.00 for a box of granola, but in this case it's almost worth it. In all my years reviewing cereals, I have never encountered such an authentic fruit flavor. The title "Summer Berry" is right on the money. Each bite of this cereal has a fruity freshness. The oats have absorbed the fruit flavor and the entire cereal is a treat. Even the milk gets a fruity boost when it's added. 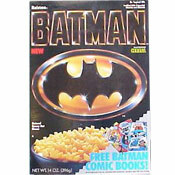 The black berries in this cereal are almost magical. There aren't as many as the spoon on the box would have you believe, but when milk is added, they seems to completely revert from a dry state back into their original berry form. The cereal also contains strawberry and kiwi pieces. They aren't as dramatic as the blackberries, but they do help to create a near-perfect combination of fruit flavors. Simply stated, this is best cereal with real fruit pieces on the market today. What do you think of Summer Berry Granola? Coco Beach and Mountain Medley flavors are my favorite, but this one is good too. This flavor would probably be my favorite if it had more berries in it instead of the minimal amount of fruit they come in the box, boo! I agree. This cereal is one of the BEST cereals on the market and I rarely eat cereal. In fact, I just bought 3 more boxes today. The price is a little expensive ($3.32) for the size, but it's worth it. Kashi stuff is usually pretty good and it's a safe buy. The only problem is that it's some of the most expensive stuff on the shelf.